Dr. Kevin Guskiewicz and his team use helmet accelerometers, known as the Head Impact Telemetry (HIT) systems, to identify at-risk behavior on the football field. 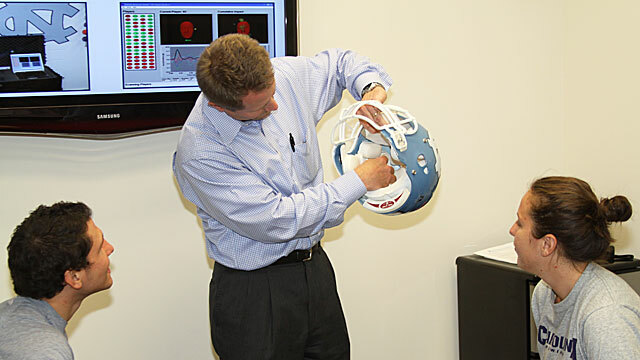 In September 2011, UNC-Chapel Hill sports medicine researcher Kevin Guskiewicz was awarded a MacArthur “Genius Grant” for his work on what he calls a hidden epidemic: sports-related concussions. That’s right: a world-renowned concussion expert wants to save, not eliminate, contact sports. These days, barely a week goes by without another news report linking sports related concussions to brain trauma. Even PBS NewsHour is jumping into the rink. Guskiewicz applauds the media for bringing attention to the issue but he stops short of calling a TKO on all contact sports. UNC-TV: Let’s break this down into very simple terms. What is a concussion? Guskiewicz: The word “concuss” means to shake violently. It’s a shaking of the head. The brain rebounds off of the undersurface of the skull and can be damaged. Most often, fortunately, it’s considered a mild traumatic brain injury because it’s temporary in nature in terms of the signs and symptoms that [athletes] experience. Kevin Guskiewicz utilizes balance and orientation tests to determine the severity of sports-related head injuries. UNC-TV: What does the public think of a concussion? Do we under or overplay it? Guskiewicz: I think there certainly has been a culture shift in the right direction, meaning we’re taking it more seriously. The media has done a great job of creating awareness about the dangers of playing while still experiencing symptoms from a concussion, and we’re trying to educate athletes, coaches, parents about those signs and symptoms and to take the right precautions in terms of staying out of play and not returning to play until the symptoms have resolved and being cleared by a physician or a clinician with training in concussion management. UNC-TV: In which sports are athletes most prone to suffering a concussion? Guskiewicz: [With] any collision sport there’s a higher incidence of concussion. So football, lacrosse, hockey, wrestling, gymnastics. Those tend to sit at the higher end of the incidence rates in terms of concussion. UNC-TV: How do you know you’ve suffered a concussion? Guskiewicz: Common signs and symptoms are headache, dizziness, blurred vision, feeling as though you’re in a fog or having concentration problems. If you go back 15, 20 years ago, it used to be, “Johnny hasn’t lost consciousness, so he hasn’t sustained a concussion.” Less than 10% of concussions involve loss of consciousness. So it’s admitting you don’t feel quite right. It’s been described as a hidden epidemic. Unlike an ankle sprain, we can’t see this injury. X-rays can’t be used to identify the injury. UNC-TV: In the everyday world, are concussions a big deal? If you get a couple in high school playing football, should you worry about it when you grow up and go about your daily life? Guskiewicz: At UNC, we house the Center for the Study of Retired Athletes. We’ve been studying retired NFL football players for the last 11 ½ years. Those with a history of three or more concussions are at an increased risk for depression or a precursor to Alzheimer’s. We do need to be concerned that once a young child or a high-schooler has had two or three concussions, we begin to ask the question, what does that mean for that individual at age 35, 45, 55? And so the late in life consequences must be considered in managing these acute injuries. Kevin Guskiewicz, Ph.D., ATC is the Kenan Distinguished Professor and chair of the department of exercise and sport science in UNC’s College of Arts and Sciences. To see a recent QUEST Northern California video about concussions, watch our Sidelined: Sports Concussions video story.